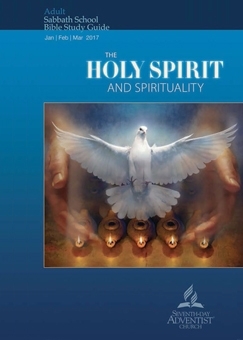 COMMENTARY ON "THE HOLY SPIRIT AND LIVING A HOLY LIFE"
This week’s lesson illustrates the problem of attempting to apply the New Testament commands to believers as if those commands were the marching orders for all humanity. One cannot read the New Testament and apply the apostles’ instructions for holy living unless one has first entered the new covenant through faith and trust in the Lord Jesus. Here is the problem in a nutshell: Adventism does not teach the biblical teaching of the new birth. Adventism cannot teach the new birth because as an organization (and thus as a subculture), Adventists do not understand or believe that humans are both body and an immaterial spirit. This lack of belief in the biblical nature of man results in an complete misunderstanding of the teaching of the New Testament. One simply CANNOT become Christlike by praying and “looking to Jesus”. The commands to “be holy” have nothing whatsoever to do with the law; moreover, they have nothing whatsoever to do with developing a Christlike character. Only the work of God can create a Christlike character; it is not the result of prayer, meditation, and the creation of new habits. It is only the result of being given a new heart and the indwelling Holy Spirit as a seal based on one’s trusting in the Lord Jesus’ sacrifice as payment for sin. Someone has rightly said that the gospel is not for the purpose of making bad people good, but it is for the purpose of making dead people alive. And this astute observation brings us to the foundation of the problem: Adventism does not believe in original sin—in depravity. Scripture teaches that every one of us is born dead in sin, doing the will of Satan. All of us are “by nature children of wrath” (Eph. 2:1-3). Moreover, there is not one person who can please God, seek God, obey God, or even desire to do good apart from the intervention of God (Romans 3:9-18). Believing in Adventist doctrines does not equal being born again. Deciding to “follow Jesus” does not equal being born again, nor does baptism. Rather, being born again involves repentance, and acknowledgment of one’s intractable sin that one cannot overcome. No matter how much we pray and retrain our habits, we cannot even overcome or avoid sin apart from acknowledging out true condition and accepting the blood of Jesus as the payment for our sin. This passage in Romans states what Adventism cannot explain: the Law and the prophets are not part of the righteousness of God’s people; rather the Law and the prophets foretold—witness to—the literal, personal righteousness of God. This actual righteousness of God Himself comes to those (see verse 22) who have faith in Jesus Christ. No one can become sanctified or have righteousness unless he or she admits he is utterly sinful and table to avoid sin and allows Jesus’ shed blood to be the payment for his or her sin. Adventism simply does not teach that the Lord Jesus finished His atonement and that His blood completely blots out our sin when we place our faith and trust in Him. Instead, Adventism teaches that sins are only “pardoned” and somehow “stored” in heaven, carried there by Jesus’ blood, until the investigative judgment is over. Some progressive Adventists, on the other hand, take the view that Jesus’ death paid for all sin, so we are born forgiven and simply have to acknowledge that fact to enjoy the benefits of it. In other words, one has to “opt out” of salvation in order to be lost. While the Bible clearly teaches that Jesus died for the sins of the world, it does NOT teach that His blood forgives the sins of every person. Instead, only those who repent and believe that He is their Substitute who took the curse of the law onto Himself and broke its power will receive forgiveness. There is no forgiveness apart from a personal submission to and acceptance of Jesus’ sacrifice on our personal behalf. Once a person is born again, once a person has believed and has been sealed with the Holy Spirit as Ephesians 1:13-14 describes, only then do the calls to holiness apply to one. Only one who has passed from death to life by believing in the Lord Jesus (Jn. 5:24; 3:18) can submit to the Lord Jesus whenever a temptation occurs and find a way of escape. Prior to being born again and made alive, a person has absolutely no ability to avoid sin. Even if one makes moral choices, if he is still dead in his sin because he has never trusted in the Lord Jesus’ shed blood for him, those moral choices are not holiness. Paul explains in Philippians 3 that every moral, altruistic, law-abiding work of one who is not alive in Jesus is “filthy rags”. We do not become sanctified by creating new habits and avoiding sin, because we absolutely CANNOT avoid sin apart from trusting Jesus as our Substitute and receiving His eternal life now. Those who are born of the Spirit, however, will literally have the life of Christ in them. This life is not figurative or transient. It is actually the eternal life of God, and when we receive it, we are at that moment transferred out of the domain of darkness into the kingdom of the Beloved Son (Col. 1:13). This life of Christ will cause us to being to have new desires, new power, new potential, new priorities, because our old self is gone. At the same time, Paul explains carefully in Romans 7 that we still have a “law of sin” in our members. Our new, living spirit still inhabits a mortal tent that has a law of sin in it. This reality causes the struggle Paul describes in Romans 7, the struggle between ones’ flesh being drawn to indulgence and sin, and one’s mind and person loving God’s law. It must be noted, however, that Paul makes it clear that it is not the Mosaic law that governs the born again. The law reveals our sin and condemns us to eternal death. The law’s purpose was to show us that we are hopeless and under an eternal death sentence apart from trusting the Lord Jesus. When we trust Jesus, the One who fulfilled the law, we receive His obedience and righteousness and the fulfilled law as our imputed GIFT. Our obedience is no longer to the law; it is to our triune God who Authored the law. Every command and principle in His word is a revelation of our inheritance. As His adopted, born-of-God children, we have, for the first time, the ability to submit to Him when we face temptation instead of fighting sin. Of course we struggle; our flesh is powerful, and we can drift away from trust as we become distracted by temporal things, but if we are born again, reality is different for us because we are alive instead of dead. Obedience to the law and to moral principles does not yield holiness. Adhering to practices and laws when one is not born again may make one a better citizen, but it is not sanctifying. Only those who have been born of the Spirit are sanctified and are being sanctified. Moreover, when born again people submit to the Lord instead of fighting with their wills in the face of temptation, this submission and trust and giving up of one’s “rights” to indulge is the process of God’s sanctifying work. It is God who sanctifies His people, and this sanctification results in changed tastes, desires, and responses. Sanctification does not come from looking at the law and incorporating it into one’s life. Rather sanctification occurs as one trusts the Lord Jesus in deeper and deeper ways, surrendering one’s rights to the Lord and allowing Him to keep His promises and provide all we need. In reality, because Jesus fulfilled the law, when we go back to the law and incorporate it into our lives instead of allowing Jesus to be our all-in-all, then we are breaking the law. The law pointed to the righteousness of God, to God the Son who would fulfill its demands and open His righteousness to us, and when we ignore Him as our ONLY necessity and try to keep the law as well, we trample on the law’s holy, righteous, and good purpose. Jesus is the fulfillment of the law. Keeping the law instead of embracing Jesus as our Substitute and Sin Bearer is to negate the finished work of Jesus. This week’s lesson is premised on Adventist hermeneutics. It misuses words like “sanctification” and makes righteousness something we gradually attain instead of something into which we grow as we submit more and more of ourselves to Him. Copyright 2017 BibleStudiesForAdventists.com. All rights reserved. Revised February 4, 2017. This website is published by Life Assurance Ministries, Camp Verde, Arizona, USA, the publisher of Proclamation! Magazine. Contact email: BibleStudiesForAdventists@gmail.com.